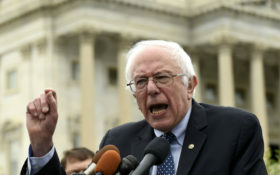 Vermont Sen. Bernie Sanders, an outspoken socialist who once praised communist dictators Hugo Chavez and Fidel Castro, just established an unconstitutional religious test for President Donald Trump’s nominees. And (surprised?) it was used to discriminate against those of the Christian faith. That’s no exaggeration. A sitting senator just acted in direct violation of the United States Constitution to attack a Trump nominee for the White House Budget Committee — but because Sanders is liberal, the mainstream media hasn’t said a word. At a confirmation hearing for Trump’s deputy budget director nominee Russell Vought, Sanders went on the attack over a 2016 blog post where Vought defended his Christian faith as theologically separate from Islam. Vought responded, “Absolutely not” and began to explain — and was aggressively interrupted and shouted down by Sanders multiple times. Religious tests are expressly forbidden in the U.S. Constitution. Folks, what Vought said isn’t a controversial statement. In fact, this is what all members of the Christian faith learn during day one, hour one of any decent Sunday school stuff. One must accept Jesus Christ as one’s Lord and Savior to find salvation; it’s a cornerstone of the Holy Trinity, and essential to the Christian faith. Christ is risen. He is the living God, the right hand of the Father Almighty. Without knowing Christ, one cannot know God. To not know God is to be condemned. Simple and straightforward, this is part of the very basics of Christianity. What’s next? Will Sanders force government nominees to deny the Resurrection of Christ because it’s not in the Quran? This so-called “Islamaphobia” witch hunt is out of control. Sanders questioning is an attack on Christianity itself. A sitting senator literally violated the constitutional rights of Vought — and the media is going to let him get away with it.